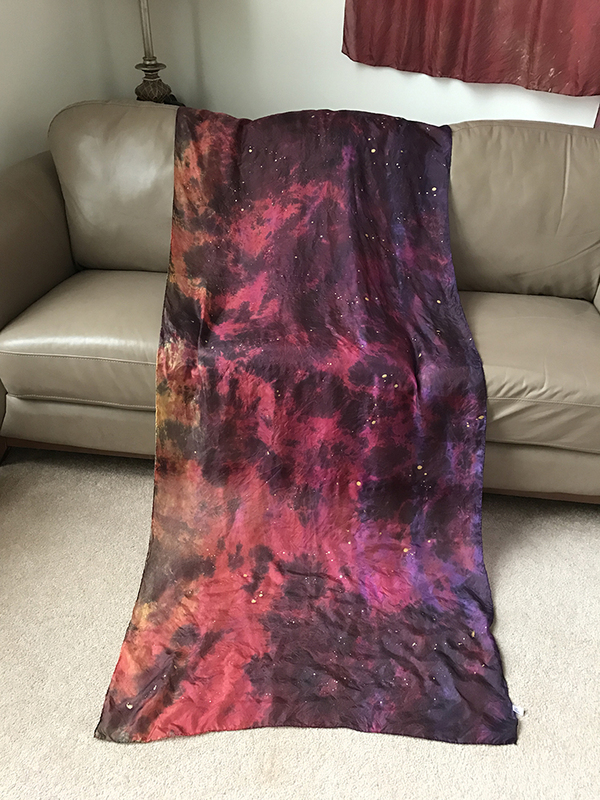 This version of this silk called From Mourning into Dancing (the ones in the flag videos at the bottom and the pictures below, were created by doing what I call over-dyeing. 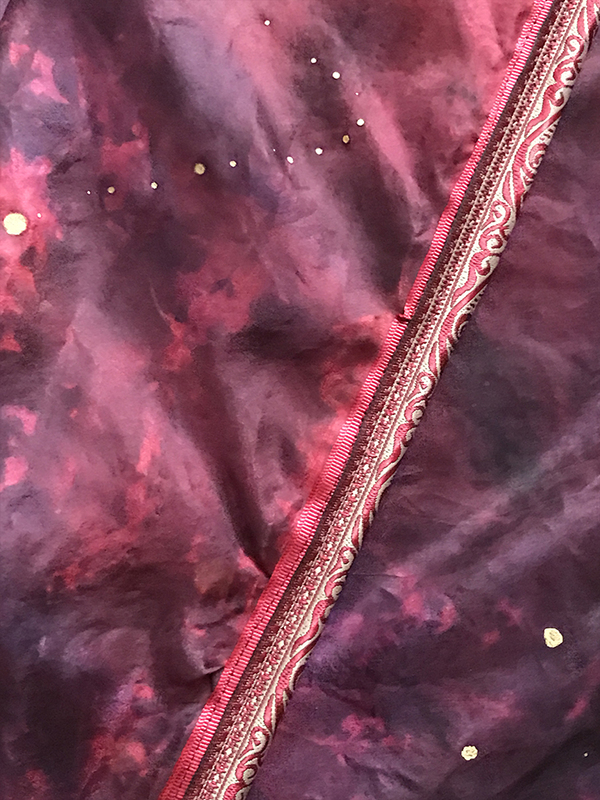 I took 2 existing silks called Fellowship of Christ’s Suffering and over-dyed them with black (because that was the color He said) and then added gold shimmer. They came out beautifully if I say so myself! Each video is one of the quills that was made from the two silks. They’re identical except for the ribbon along the quill (mine is plain red and the other has a special woven accent ribbon too. 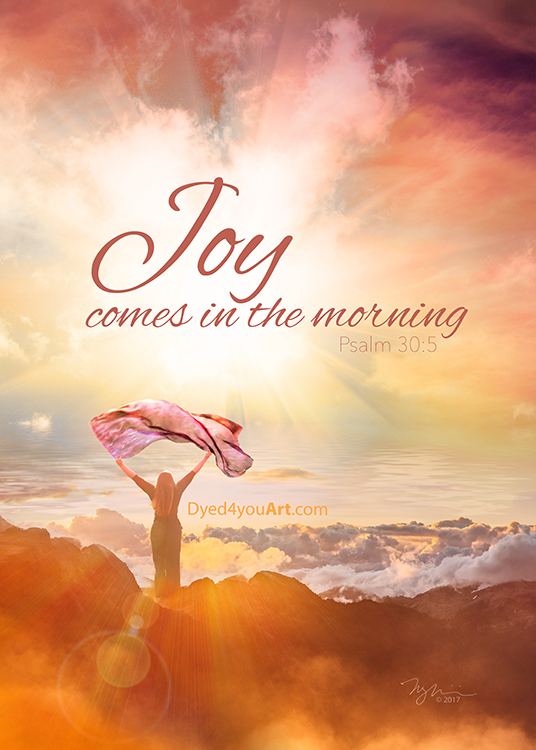 The special ribbon one ended up in a new Dyed4you Art piece called Joy Comes in the Morning – I shared it below both with and without the scripture on it. I’ve included the word for the art below as well.). Romans 8:16-18 (NKJV) The Spirit Himself bears witness with our spirit that we are children of God, and if children, then heirs—heirs of God and joint heirs with Christ, if indeed we suffer with Him, that we may also be glorified together. For I consider that the sufferings of this present time are not worthy to be compared with the glory which shall be revealed in us. 2 Corinthians 1:5 (NKJV) For as the sufferings of Christ abound in us, so our consolation also abounds through Christ. Psalm 30:11-12 (VOICE) You did it: You turned my deepest pains into joyful dancing; You stripped off my dark clothing and covered me with joyful light. You have restored my honor. My heart is ready to explode, erupt in new songs! It’s impossible to keep quiet! Eternal One, my God, my Life-Giver, I will thank You forever. Through him we have also obtained access by faith into this grace in which we stand, and we rejoice in hope of the glory of God. Not only that, but we rejoice in our sufferings, knowing that suffering produces endurance, and endurance produces character, and character produces hope, and hope does not put us to shame, because God’s love has been poured into our hearts through the Holy Spirit who has been given to us. This silk covers an understanding and identifying with the sufferings of Christ – the weighty sorrow – and then the shift from tears into laughter, mourning into dancing, and sadness into joy. There is beauty in allowing the mourning to run its course. Not hindering it or stuffing it down. There are things worth mourning, but He doesn’t leave us in that dark place – for joy comes in the morning. So just as you’ve embraced the weighty sorrow, equally release it to embrace the joy, laughter, and dancing. To embrace the joy and celebration in no way negates the weighty moments or their implications and consequences. There is simply a “time for all things”, insisting on staying in the weighty when it is a time of celebration won’t help, it will only bring misalignment with God’s flow. Therefore embrace the joy, and allow His restoration, healing, and celebration to overtake you. It is a time to dance! A portion of a word from Elisa Eaton of Waiting in the Wings called “Love Will Lift Us” is connected to this. David Brymer’s song “Restoration” is connected to this. It reminds us that the Lord brings restoration. He’s taken our pain, shame, and mourning and given us a new identity and overwhelming joy. We receive His restoration with grateful exuberance because He makes all things new. Psalm 149:3-4 (TPT) Break forth with dancing! Make music and sing God’s praises with the rhythm of drums! For he enjoys his faithful lovers. He adorns the humble with his beauty and he loves to give them the victory. Beloved, rejoice and be glad for I AM good. I crown you with righteousness and cloak you in mercy. Declare My faithfulness in all the land. Sing praise to the One who is worthy – the One who loves you beyond comprehension. Sing the song of one who is deeply loved, for you are. Dance, beloved. Dance with joy as one who has been redeemed and set free. Give yourself as a joyous wave offering before your King. Rejoice, beloved. Be a praise-filled warrior with eyes firmly fixed on Me. 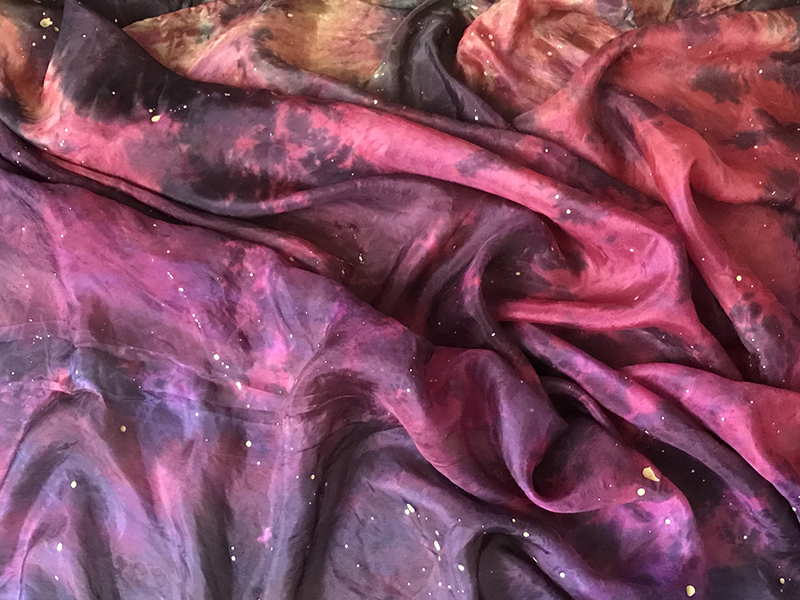 A word called “Fullness of Joy” from June Reinke of Prophetic Light is also connected to this silk. The word welcomes you into the presence of God, reminding you that all the hurt, loneliness, and sorrow that has plagued you can be lifted when the wine of His Spirit brings fullness of joy. He offers comfort and peace and a promise to heal any broken or dry places in your heart. Remember His promise to turn your mourning to dancing, beloved. He is good to His Word. He promises to saturate you and overflow you with life – cleansing the “toxins and venom of the enemy” and replacing it with the pure water of His Spirit. Receive restoration, healing, and deliverance that you may bring the same to others in His name. Receive and pour out from your overflow. John 3:30 speaks of us decreasing so that the Lord may increase – as we die to our flesh, as we allow it to be burned away in the baptism of fire, the Lord becomes greater because more of Him is seen in us. We reflect more of Him. The use of these two oils also paints a picture in the sense that fields are often burned to bring forth new life. In this same way, you surrendered to the fire in the heavy season and now the restoration – new flourishing life – will burst forth bringing more fruit than you thought possible. Light and joy and life radiating through you, a reflection of Him. And as you dance, your worship releasing that joy into the atmosphere; shifting things. Further, the dance declares victory over every area you were in mourning for. We pray it blesses you! NOTE: this word has been updated since it was originally posted. 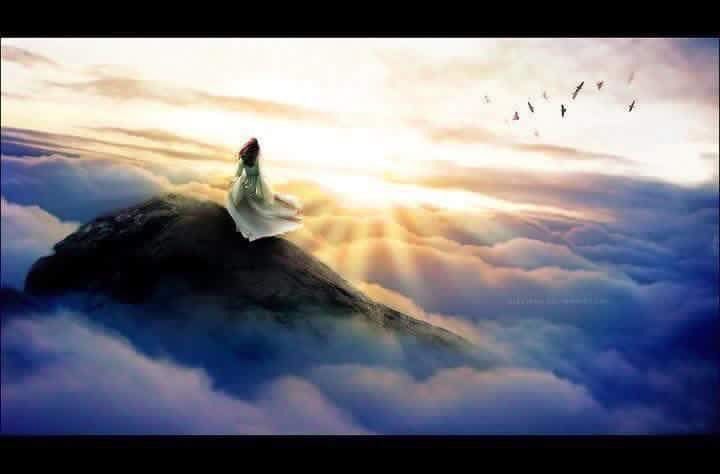 When God first started birthing words in His quiet time with me (God Speaking Through Silk), it was before He’d begun downloading the Prophetic Nuggets each day. During that time He would highlight words from other ministries to me and then show prophetic connections, all of which was shared in the letters. Over time as He began downloading more prophetic words through the Dyed4you ministry team, we began referencing other words without quoting them in their entirety. Instead, we’d summarize and sometimes share the connection we were sensing and would reference where to find the original. We did this for a variety of reasons including helping cultivate followers for the other ministries rather than simply quoting them, and also to give our Dyed4you customers a place to start as we encouraged them to dig into God’s mysteries themselves. This word has been updated to follow the new format. Sorry my framing was a bit off on the one below. It’s the one with the special ribbon. 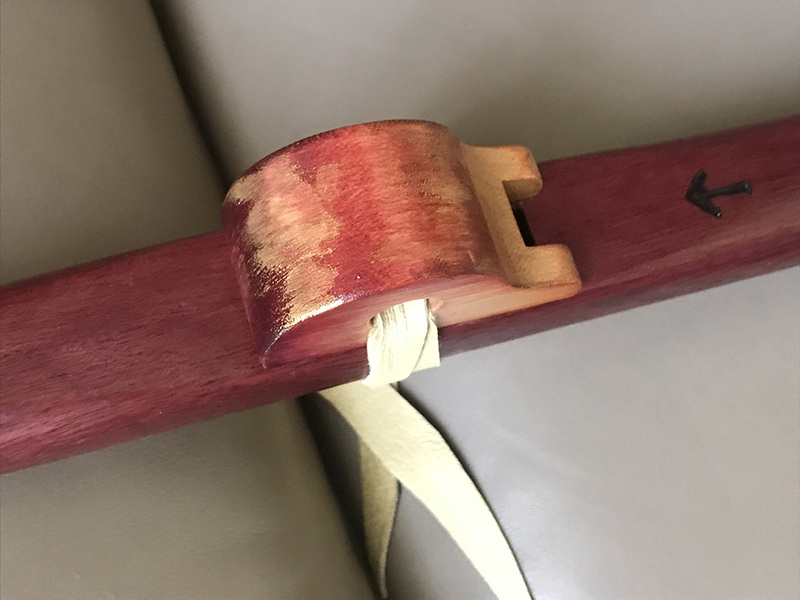 7/7/17 update – since I regifted my quill to someone else in the Dyed4you Community (whose response to them was “I am sure it is no coincidence the flag you sent, but I wanted you to know that it means more than you know or that I can put into words in just a few sentences. Thank you for your kindness and sweet gesture. I will treasure it.”), Papa released me to remake this style for myself as large spin wings and I LOVE them! 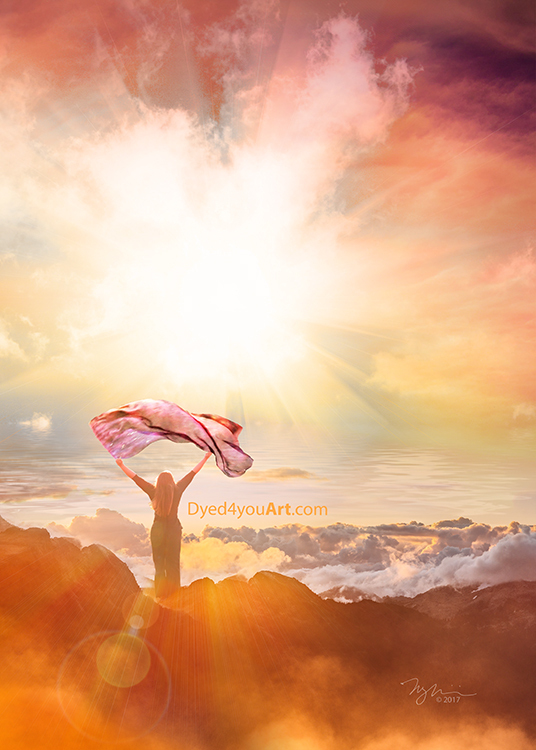 This entry was posted in silk words and tagged breakthrough, depression, desert, Dyed4you Art, Dyed4you silks, glory, joy, persistence, promises, trust, video, wait, worship/praise by Meghan. Bookmark the permalink. 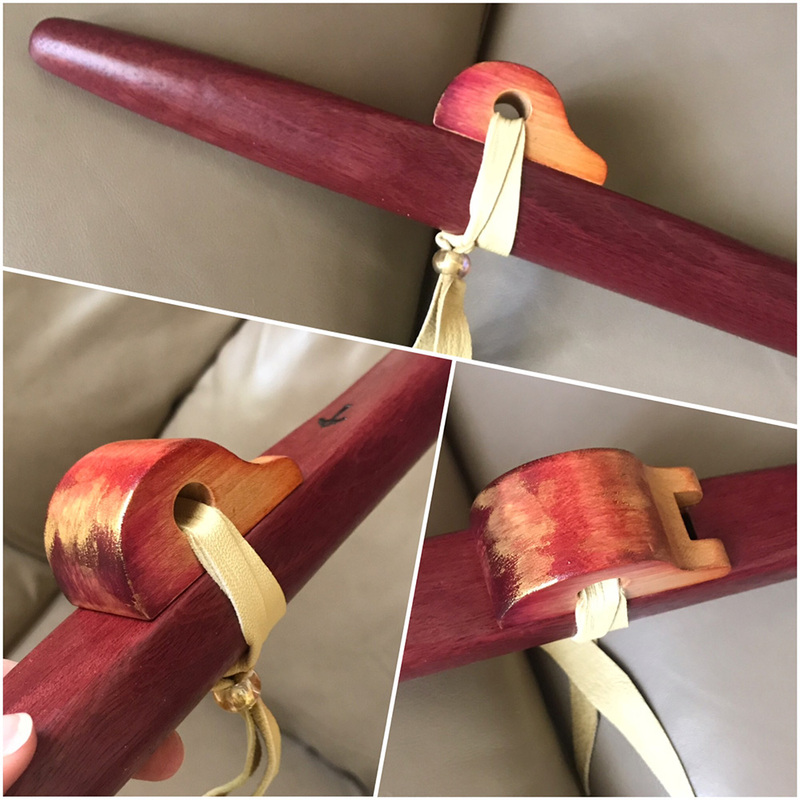 This silk is simply beautiful! Going to reread this again and let it sink in… Such depth in color and meaning- so many things to contemplate! This really spoke to me had a rough year and would find myself telling God its been a really long night but His joy has come not only in the mourning but in the mourning. He quiets us with His love so this spoke volumes to my heart. Flagging has been tone of the main things that has kept me near Him. In that place of intimacy and worship I have able to step out of the night and out of mourning into His joy. These stories always encourage me and every flag you’ll share is so uplifting. This is such a blessing. Thank you’ll for sharing. Father had me pass along my flag that is in this image. I also made sure to share the image too. Here was her response (love God’s confirmations)! Inspiration today. Your pictures and today’s word and the pic I used on Facebook seem to go in sync. The Father says, “You are My Burning One! Where once I spoke through a bush, but now I speak through My Sons and Daughters. Choose My ways and you will see the Unimaginable as waves in the Ocean. Heaven is closer in this Hour. Hear the Celebrations taking place in your honor. Let what is to be make room in the void of what is past. I promised to give you Joy for your sorrows. Seasons come and Seasons leave. What I have for you is worth far more than all of the jewels of royalty. I will erase what was less than My Best in your days. I am near to the brokenhearted and I weep when you weep. What you sow in tears will you reap in a beautiful harvest. Doors are closing all around you. This is for your good and not a detriment. Do not chase after what is behind you even when it was a blessing for a time. I have more for you and until you let go, I cannot fill your hands once more. Trust Me for I will not fail you. The stepping stones before your feet will safely take you through the Valley, over the Sea, through the Forest, and over the Highest Mountains. A “whisper” called “Everything about you is going to change.” from the Passion Translation team’s “I Hear His Whisper”. “No one can understand the depth of My work in your soul. Others can only speculate over what I am doing in your life. They see the struggle, the pain. But I see the glory of the crown I’ve placed on your head. I see you in the place where you sit at My right hand, taking your regal throne as My partner and My friend. The call on your life is divine and delightful. Let no one disturb your peace as your reign with Me and discover more of My love.